Adding value to your purchase, Austin Bazaar bundles your instrument with necessary accessories. Everything you need to start playing immediately comes in one box. Save yourself the hassle and save some money while you’re at it. A hard case is included so you can keep your instrument safely packed away when you’re on the go. An easy-to-use clip-on tuner is included so you can keep your instrument in tune. A strap is included so you can practice or better yet perform while standing up. Strings are included so you have extra for later. Picks are included so you can start playing right out of the box. An Austin Bazaar instructional DVD is included so you can pick up some tips while learning your new instrument. An Austin Bazaar polishing cloth is included so you can keep your new instrument in mint condition. The new Yamaha FGX830C acoustic-electric guitar has louder and stronger sound in the low- to mid-ranges, thanks to cutting-edge acoustic analysis with the development of the new scalloped bracing patterns. 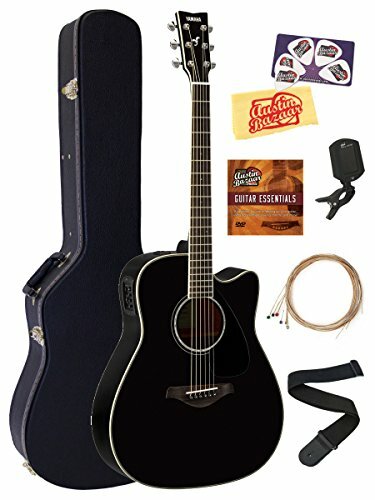 Derived from Yamaha’s popular FG830 guitar, which has the solid spruce top and rosewood back and sides, the FGX830C also has a cutaway body and the electric system. Yamaha’s proprietary under-saddle piezo pickup and System66 analog preamp ensure the solid plugged-in performance. Every aspect of the FGX830C model is crafted to make a better guitar. From painstakingly cured and dried woods to beautiful hand-sprayed finishes and detailed quality control checks each and every FGX is made to be a lifelong partner.